What the Book of Revelation means by the 'binding of Satan'. If I was a Full-Preterist I would have to believe that every prophecy and every intention of God was already fulfilled- and therefore that the supernatural gifts of Spirit ceased with the close of the Old Covenant in 70AD. But I’m not a Full-Preterist. I believe in miracles for today. I believe in the New Testament’s promise of the Baptism with the Holy Spirit for the believer today. I’ve been a Pentecostal Pastor now for more than 20 years. But I’m not a Dispensational Pentecostal (which I find an oxymoron) who regard the Devil as requiring the believer to mortally combat in order to further the Great Commission. This Dispensational concept of over-stating the power and role of Satan is rooted in the heretical notion that Christ descended into Hell to wrestle the keys of Hell and Death out of the hand of Satan in the corridors of Hell in order to achieve our salvation. And therefore in order for the believer to live a victorious life they must constantly battle Satan, says the Dispensational Pentecostal. In this way, God disarmed the evil rulers and authorities. He shamed them publicly by His victory over them on the cross of Christ. Jesus came to destroy the works of the Devil and according to Colossians 2:15 He did just that by dying on the Cross. It wasn’t in the corridors of Hell that salvation was achieved and the Devil was defeated, it was on the Cross! While Dispensationalists argue that a method of salvation was achieved by the Cross, they reject the notion that the Devil was defeated because of the Cross. Because they read Revelation as largely unfulfilled, they also read the account in Revelation 20 of Satan’s binding as also unfulfilled and yet to happen. But this interpretation is against the tenor of the New Testament’s description of Satan’s position since the Cross. “Binding” can be physical, such as being bound by shackels, chains or ropes (Mk. 5:4) or bandages (Lk. 10:34). But it can also be non-physical. That is, someone could be bound by an oath (Mat. 23:16; Acts 23:12), a condition, or an obligation. Jesus questioned whether it was right for Him to heal a woman who had been ‘bound by Satan for eighteen years‘ (Luke 13:16). Christ also stated that we could only ‘bind’ people on earth with what what they were already bound by in heaven. In this sense, binding referred to obligations and it meant that people who could no longer do what the Pharisees had done when they invented certain rules they called ‘binding rules’ (things forbidden), instead they could only restrict people from doing what God said they were restricted from doing. When it comes to interpreting the passage in Revelation 20 about Satan being bound at the beginning of the one thousand year reign of Christ it is assumed by the Pre-millennialist (one who believes in a literal and future 1,000 reign of Christ on earth) that neither the Kingdom (“1,000” years) or the binding of Satan has taken place. Silly simplistic arguments are used to rebutt those, who like me, regard the “1,000” years as linguistically representing the rule and reign of Christ from the close of the Old Covenant in 70AD to the present day (and beyond). To ignore the way the Bible uses the number “1,000” and to then impose a wooden-literal understanding of it into the Revelation 20 text is perilous. Job says that he could ask a thousand questions of God and have them all answered. Surely this language is stating the enormous depth of God’s knowledge rather than limiting God to the capacity to only answer a thousand questions. The Law-Giver says that God’s love extends to a thousand generations to those who keep His covenant. Surely God’s love does not expire after a thousand generations of humanity? The Psalmist said that God owns the cattle on a thousand hills. Does this imply that the cattle on a 1001st hill are not God’s? It appears that the Biblical usage of a thousand paints a picture of a number so large that it’s not meant to be counted. That’s exactly what it means in Revelation 20. Secondly, since Satan is a non-corporeal being (that is, he doesn’t have a physical body) physical objects, such as metal chains, cannot restrict him. Therefore, whatever binding means in Revelation 20:2, its certainly cannot mean a physical restriction. Since we have already seen that binding can mean something non-physical, it is far more probable that the binding referred to in Revelation 20:2 is symbolic language for restriction. The Cross terminally weakened Satan, and the culmination of the Old Covenant in 70AD destroyed his ability to exploit the condemnation of the Mosaic Covenant. The teaching of the New Testament is that Christ came to defeat the works of the Devil. For those who believe that nothing changed for Satan since the Cross, then the statement in Revelation 12:12 becomes non-sensical as they are forced into the absurd position of claiming that the Devil’s short time is from the Cross to the present day. This type of Bible interpretation requires mental, theological, and exegetical gymnastics. For those of us not prepared to abandon the ordinary rules of Bible interpretation (including: Context, Non-Contradiction, Original Intention) such fanciful interpretations are not only ridiculous but impossible. And this gospel of the kingdom will be proclaimed throughout the whole world [Greek word: “oichoumene”, def’n: ‘Roman Empire’] as a testimony to all nations, and then the end will come. When all those living under the Old Covenant had had an opportunity to convert to Christ and accept the New Covenant, the Old Covenant could end. With the end of the Old Covenant came the ‘binding’ of Satan. From that point Satan could no longer come into the presence of God (as he did in Job 1-2), instead he was ‘bound’ from approaching God, and ‘bound’ for eternal damnation (“bottomless pit”). Satan was defeated at the Cross. He was bound at the close of the Old Covenant. This means that he is restricted from deceiving nations and accusing the brethren in the presence of God (since he is now cast out of heaven). For those who claim that if Satan is bound now “he certainly has a long leash” – I suggest that if he isn’t bound now he certainly lacks imagination! If Satan is not now restricted from conducting unlimited evil by the Lordship of Christ then his lack of rampant evil is bewildering. The Biblical expression “1,000” speaks of not meant to be counted. God owns the cattle on a 1,000 hill, Job could ask 1,000 questions and each time receive an answer, God’s faithfulness is to 1,000 generations, and so on. In a similar way, after the close of the Old Covenant Age with the destruction of the Temple and abolition the sacrificial system, Christ established His New Covenant reign. There will eventually come a time when Christ will hand over this Kingdom to His Father (1Cor. 15:24) at His Appearing. HOW FAR INTO THE FUTURE DID REVELATION CLAIM SATAN WOULD BE BOUND? The revelation of Jesus Christ, which God gave him to show to his servants the things that must soon take place. He made it known by sending his angel to his servant John…Blessed is the one who reads aloud the words of this prophecy, and blessed are those who hear, and who keep what is written in it, for the time is near. It flies in the face of logic to claim that although it plainly states that its contents are immediately about to happen, it actually meant that they were thousands of years off! That is an absurd interpretation. This also relates to what it says about the doom of Satan. Partial Preterism interprets Satan’s “time is short” (Rev. 12:12) as the forty or so years (an incredibly short time in the scheme of Biblical history) as being from the Cross to the destruction of Jerusalem. To suggest that Satan’s “short time” was from the Cross to the present day defies all ordinary senses of language. 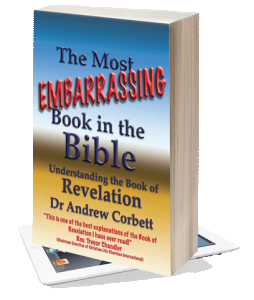 In my eBook, The Most Embarrassing Book In The Bible (Understanding The Book of Revelation), I present the case for most of the Book of Revelation being fulfilled. Therefore, there is a strong case to be made from both the witness of Scripture and history that the Dispensationalist’s claim that Revelation is mostly about the future is without credibility.